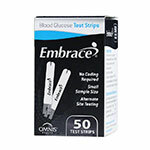 The Free Embrace Talking Meter Kit with the Purchase of 200 Test Strips provides accurate results in just 6 seconds with just a small 0.6mL blood sample. No Code Technology delivers a more accurate result with less potential for error. 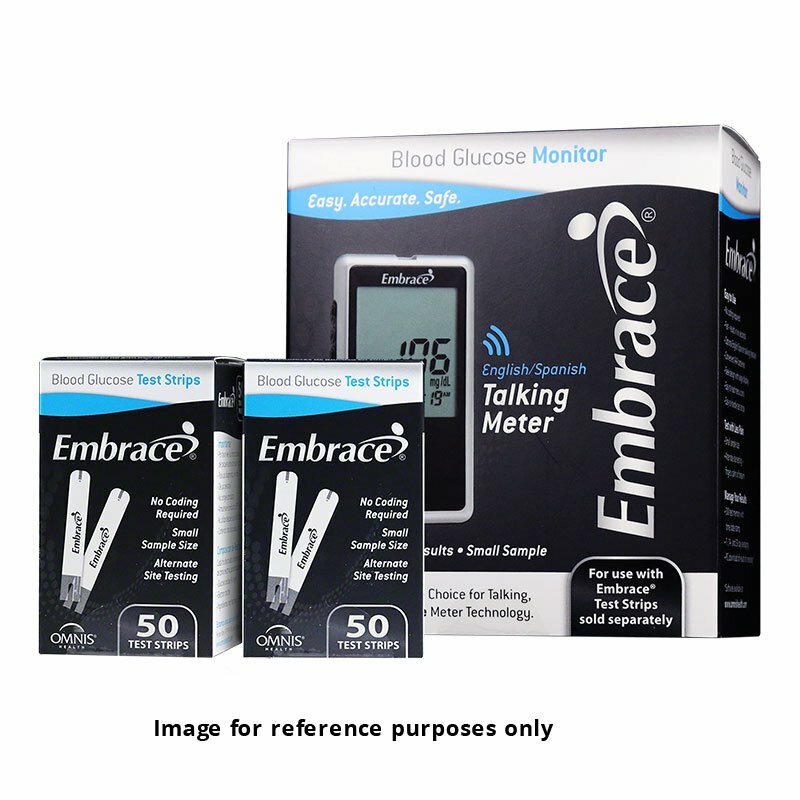 The Free Embrace Talking Meter Kit with the Purchase of 200 Test Strips provides accurate results in just 6 seconds with just a small 0.6mL blood sample. The no code technology in the meter delivers a more accurate testing result with less potential for error. The Embrace is ideal for anyone that is visually impaired - the meter features a large display screen and is able to speak the test results in both English and Spanish. 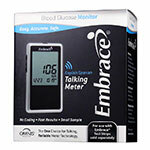 This offer is for one Free Embrace Talking Meter Kit with the Purchase of 200 Test Strips. Speaking meter - English or Spanish! Package also includes 200 Test Strips. 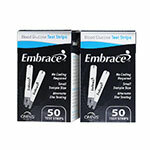 Expiration on these Embrace strips will be 12 months or more. Note - Limit one meter per customer. I ordered using many in my medical office. Accuracy, ease of use and very reasonable price what makes this meter my favorite. I would have thought that a Lancet tool would have been included. Very happy with this item, it was not expensive and neither are the test strips! Super fast shipping too! Will continue to order from here. I had this meter for mother for 8 years and I am very happy with it. The price is just right the strip. I definitely recommend it to other. This meter get the job done as it should. No mess no fuss. 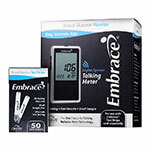 Embrace Blood Glucose monitors and strips are very cost effective. Embrace glucometers are easy to use, provide audio guidance on the steps of the testing and an audio readout of the result.